Choosing the right cabin is tricky under any circumstance -- choosing the perfect room (or set of rooms) for a large family or one with young children is even harder. Can you find a room with a bathtub for your little one without splurging on a suite? Can you fit a crib in your cabin if you're also using the sofa bed? Should your family of five squeeze into one room or book two adjoining cabins? 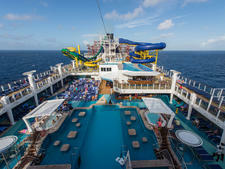 Are any staterooms designed with actual families in mind? With cruise lines introducing new cabin types with every new ship, it's hard to keep track of what your family's options even are. On the plus side, there are now options for every family group, from connecting room configurations to standard cabins with family-friendly amenities to spacious family suites that can fit five, six, eight or more. To ensure your whole family can rest easy at sea, we've broken down the family lodging options aboard the most popular cruise lines into two types: designated family cabins (rooms or suites intended for families) and family-friendly staterooms (which anyone can book, but may have space and amenities useful for family groups). Read below to find the perfect cruise cabin for your whole crew. And for more advice on choosing the best cabin, read our tips on booking a cruise room for the whole family. Known for high-adrenaline activities, including rock climbing, zip-lining, surf and skydiving, Royal Caribbean is catering to families with a wider range of activities and cabin categories (37 on some vessels) aboard its newer Quantum- and Oasis-class ships. 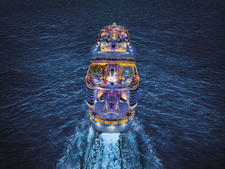 Royal Caribbean has some of the biggest family cabins in the industry, with multiple configurations. Family Interior Staterooms: Available on Freedom- and Oasis-class ships, these windowless rooms accommodate up to six people, with two twin beds that convert to a king, a double pullout sofa and two Pullman-style bunk beds. The Family Interior Stateroom is the least expensive option for up to six passengers. Family Ocean View Staterooms: Available on Radiance-, Voyager-, Freedom- and Oasis-class ships, these cabins feature a picture window and accommodate up to six people, in the same bed configurations as the Family Interiors. These cabins are in the front of the ship, which means you'll feel more motion and may not be best for family members prone to seasickness. 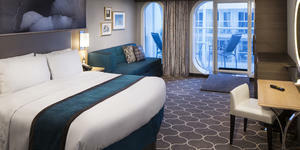 Oasis-class ships also feature 290-square-foot Family Ocean View Staterooms with Balconies, which also sleep up to six. Family Connected Junior Suite with Balcony: A suite configuration that debuted aboard Quantum of the Seas, it's made up of three different categories of staterooms -- a junior suite, a superior balcony stateroom and a studio cabin (which can actually sleep two) -- that connect to accommodate up to 10 passengers. This is a great choice for single relatives who want to travel with the family, yet have their own space. Royal Family Suite: If you have more money to spend, these 560- to 580-square-foot two-bedroom suites (available aboard Voyager-, Freedom-, Oasis- and Quantum-class ships) hold eight people -- two bedrooms with two twin beds that can be pushed together for a king bed and a living area with a sofa bed that pulls out to a double bed. Two Pullman-style beds pull out from the wall and serve as upper level bunk beds. There's a veranda and two bathrooms, one with a bathtub and one with a shower. Loft Suites: The newer Royal Caribbean ships feature stunning two-story Loft Suites that, while not specifically geared to families, can sleep up to six with one or two bedrooms and sofas that convert to double beds. Plus, they have two bathrooms, one on each level. Aboard Oasis of the Seas, for example, the Royal Loft Suite (the largest of all lofts) connects to the adjacent Crown Loft Suite to create an enormous living space that can sleep 10. Aqua Theater Suites: Oasis-class ships keep families entertained with suites that overlook the Boardwalk area and AquaTheater water-based performance venue. Inside, the suite can sleep up to eight with two bedrooms, one with additional Pullman beds, and a convertible sofa; it is also has two bathrooms (one with tub), and a living and dining area. 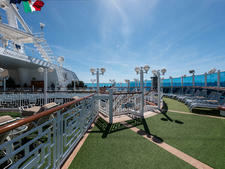 Outside, a wraparound balcony features lounge and dining areas and uncrowded viewing of the shows and scene below. Presidential Family Suite: This lavish suite fits 14 aboard Quantum of the Seas, Allure of the Seas, Freedom of the Seas, Independence of the Seas, Liberty of the Seas and Oasis of the Seas. These suites include four bathrooms (two masters and two bedrooms with twin beds convertible to kings and pull-down bunks), spacious living and dining areas, and huge balconies with alfresco dining tables, hot tubs and wet bars. Ultimate Family Suite: The Ultimate Family Suite on Symphony of the Seas has to be every child’s fantasy. At a massive 1,346 square feet and spanning two decks, the upper and lower levels are connected by a tubular orange slide. But there's more: a Lego wall, a dining table that converts to an air hockey game, an 85-inch HD TV, swinging basket chairs, table tennis, a whirlpool, a big stack of board games and a climbing maze on the balcony. Accommodation comprises a double bed, four bunks in a separate room (with individual TV screens) and a sofa bed, and there are two bathrooms. Standard cabins hold a maximum of four people, but Royal Caribbean's Quantum-class ships have many connecting cabins, about 25 per deck, of different configurations -- quads that connect to quads or quads to doubles. Royal Caribbean has plenty of different suite configurations that sleep four if you simply want more space. One interesting addition aboard inside cabins on Navigator, Quantum and Anthem of the Seas is the "virtual balcony" -- window-size TV monitors playing a live feed of what's happening outside. Royal Caribbean's partnership with Dreamworks means that Dreamworks movies and TV programming play on in-cabin TVs. Complimentary Pack 'n Plays and minifridges can be delivered to the cabin. Diaper bags can be ordered for an additional fee, filled with diapers, wipes, diaper cream and a changing pad. They are delivered to your cabin (you can also order baby food and packs of diapers). With increasing fees for carry-ons and luggage, this is a huge perk if you're flying! The laid-back line famous for "Freestyle" cruising, meaning relaxed dress codes and dining whenever and wherever you want, has also seen an increase in families onboard. Norwegian Cruise Line's newest ships feature kid-size furniture in the buffet restaurants, and plenty of larger and connecting cabins. Norwegian's newest ships -- Bliss, Escape, Breakaway and Getaway -- feature more staterooms that fit five, more connecting rooms and more studios for the single relative who wants to join in the family fun. Family Inside: These windowless cabins sleep up to four with two lower beds converting into a queen and two Pullman bunk beds. The one bathroom is outfitted with a shower. All family staterooms are located on Deck 12, near the Splash Academy kids club, and most of the staterooms can be turned into connecting rooms. Family Oceanview: Most Norwegian ships sleep four in this category, but aboard Escape, Getaway and Breakaway, this cabin sleeps five people, with two lower beds that convert to a queen, a double sofa bed and a Pullman-style bed that drops down from the wall. Family Staterooms are located near the kids clubs, teen club and kids pools. (You'll be thankful not to have to walk across the entire ship with your toddler!) The sleeping area is separated from the living area by a small closet. Family Oceanviews generally come with a bathtub. Family Balcony: These cabins sleep up to four with two lower beds converting into a queen and a single sofa bed and one Pullman bed. The bathroom is shower-only. Look for these near the kids club on Deck 12. Family Mini-Suite with Balcony: Similar to the Family Balcony but with more space, this Mini-Suite sleeps four and includes a nicer bathroom with a bathtub. 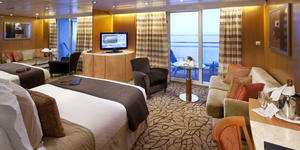 Family Suite: These suites fit up to eight aboard Pride of America and six on the Dawn-class ships. Aboard Pride of America, Family Suites include a living room with two lower beds that convert to a queen and a double sofa bed, a separate bedroom with two lower beds that convert to a queen, and additional bedding for two more passengers. There are two bathrooms with showers and two TVs. Family Suites aboard the Dawn-class ships have only one bathroom, but it has a bathtub and a shower. Some of the family suites come with a balcony, but not all. All suites on Norwegian ships include the added perk of butler and concierge service. Two-Bedroom Family Suite: These suits are available on Jewel- and Dawn-class ships, as well as Pride of America. Each family suite has a living area, dining area, a separate bedroom with a queen-size bed, as well as a separate children's bedroom, a luxury bathroom with bathtub and a second bathroom with toilet, sink and shower. There's also a roomy balcony. The Haven: The Haven is Norwegian's exclusive-access suite area, which features a private pool and sun deck and, on some ships, a dining area and lounge. It's found on all ships except for Dawn-class ships and Pride of America. The Haven's Family Villas are like two-bedroom apartments at sea, accommodating up to six people each. Aboard some ships, including Norwegian Jewel and Norwegian Pearl, there's an additional Three Bedroom Garden Villa within the Haven that sleeps eight. Other Haven suites may not be designated for families, but can sleep four to six, or can be connected with adjacent suites for humongous living areas. Standard cabins hold a maximum of four people. Certain cabins aboard Norwegian Dawn, Star, Sun and Jewel feature dividing curtains, to give Mom and Dad privacy after the kids have gone to sleep. Connecting cabins of different configurations can be good choices for larger families. Nickelodeon channel plays on cabin TVs. Complimentary Pack 'n Plays are available on request. A week's worth of diapers and wipes can be delivered to your cabin for an additional charge. Cabins offer ample storage space, including functional box-shaped seats that double as storage. Cabins have minifridges to store your own snacks and drinks. Carnival is considered one of the most affordable options for families. Its "Seuss at Sea" programs bring Dr. Seuss characters and decor to the kids clubs and ship activities, including a Green Eggs and Ham character breakfast. Carnival isn't known for over-the-top luxurious suites, but families on a budget will be glad to find almost 200 quint cabins aboard Carnival Dream, Magic and Breeze. Family Ocean View Staterooms: An affordable option for families of five, these outside cabins are available on Carnival's Dream-class (Dream, Magic and Breeze) and Conquest-class ships (Glory, Valor, Freedom), as well as Carnival Splendor. These 230-square-foot staterooms have a large picture window, but no balcony. 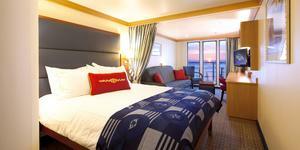 Family Ocean View Staterooms have two twin beds, two upper bunk beds and a single sofa bed. Note to parents: The two regular twins cannot convert into one queen-size bed if both bunk beds are used, as it would block ladder access to one bunk. Also note that Family Ocean View Staterooms aboard the Dream-class ships feature two bathrooms, one with a shower and the other with a junior tub. Family Staterooms aboard the Conquest-class ships have only one bathroom. Family Harbor: Carnival Vista and Horizon offer a brand new cruising concept -- the dedicated family zone. It's a space exclusively for families, with its own suites, staterooms and a lounge just for guests staying in the family cabins. The Family Harbor Suite fits five and has a partition divider between the main bedroom and the sitting area with its pullout sofa. Family Harbor Suites have two bathrooms, a full one with a shower, sink and toilet, and the second bathroom with only a sink and shower/tub combo. The lounge is designed as the ultimate family hangout with large-screen TVs, games and complimentary breakfast and snacks. A special family concierge will assist family cabin passengers in planning excursions and making reservations both onboard and ashore. Carnival ships have hundreds of connecting cabins of varying configurations. In addition, the line offers quad configurations on select inside, oceanview and balcony cabins. Standard staterooms are large compared to industry standards; inside cabins offer 185 square feet of space, and balcony cabins offer the same plus a 35-square-foot balcony. Those balconies can provide priceless relaxation space, as children are napping or watching TV. Ocean View Quad Cabins include 220 square feet of space, with a split bathroom layout; one bathroom has a tub, toilet and vanity, while the other has a shower, toilet and vanity. 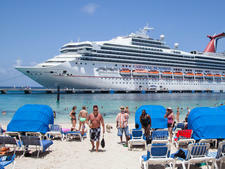 There are no designated Family Staterooms aboard Carnival Liberty and Carnival Conquest. The only "quint" cabins available are two luxurious Captain's Suites, which come with VIP check-in and priority dining assignment, allowing you the flexibility of changing your dinner time once onboard. These are the largest suites in the fleet (650 square feet aboard Liberty and 840 square feet aboard Conquest) and feature a bathroom with junior tub and shower and a private veranda. Flat-screen cabin TVs have Cartoon Network, as well as pay-per-view movie options. Complimentary Pack 'n Plays are available upon request. Considered by many to be the gold standard among family cruise lines, Disney pioneered the simple addition of the privacy curtain (dividing the sleeping and living room area) and the family-friendly bath-and-a-half concept -- a sink and toilet in one and shower/tub combo and sink in the other. This goes a long way in getting everyone out the door and reducing the number of daily arguments. Disney "quint" cabins range from 200-square-foot family staterooms that feature Pullman-style pullout bunk beds to the luxurious 1,000-plus-square-foot concierge-level Royal Suite, with private veranda and separate master bedroom. Every cabin on a Disney ship could be considered a family cabin, but some are specifically flagged as family-focused accommodations. Deluxe Family Oceanview Stateroom with Veranda: Five fit into this 300-square-foot stateroom with balcony. There's a queen bed, double convertible sofa and upper pull-down bunk bed. Deluxe Family Oceanview Stateroom: The balcony-less version of the Deluxe Family Ocean View Stateroom (found only on Disney Dream and Fantasy) offers 241 square feet of space and one or two round portholes, deep enough for built-in window seats. There's a queen bed, single convertible sofa, wall pull-down bed and upper pull-down bunk bed in cabins that sleep five; some only sleep three or four without the pull-down beds. Concierge Family Oceanview Stateroom with Verandah: All Disney ships now offer larger family suites that offer additional perks -- priority boarding and tender service, 24-hour concierge, access to a private sun deck and delivery of entire meals from the restaurants via room service. The Concierge Family Oceanview Stateroom with Verandah measures 306 square feet (including the balcony) and sleeps five with a queen bed, double convertible sofa and upper pull-down bunk bed. Many cabins that sleep five and up are not actually designated Family Cabins. For example, Concierge Royal Suites, the fleet's largest staterooms, accommodate five aboard Disney Dream and Fantasy, and up to seven passengers aboard Magic and Wonder. One Bedroom Suites with Verandas are 620 square feet with a balcony and two full bathrooms, one with a whirlpool tub. It sleeps five in a master bedroom with a queen bed and a living area with a double pullout sofa and a single bed that pulls out of the wall. Disney ships feature some 500 connecting cabins. Larger families and groups traveling together will find ample quint and quad cabins that connect to doubles and triples. And if you're a family of just three or four on a budget, Disney has worked its magic on interior cabins. These 184- to 214-square-foot cabins feature "Magic Portholes" aboard Disney Dream and Disney Fantasy. These are flat-screen TVs made to look like a porthole window, which display views of what's happening outside (as seen by cameras mounted on the exterior of the ship). Kids will particularly love the occasional Disney character that pops up on the screen. All cabins feature Disney's bath-and-a-half, with most having a bathtub in one of the bathrooms. Complimentary crib or Pack 'n Play, bottle warmers and diaper pails for in-cabin use are available on request. Beds are elevated to provide more storage. Room service will deliver kids menu items, including macaroni and cheese and Mickey ice cream bars, as well as pureed food for babies. "Babies Travel Light" add-on package allows parents to pre-order baby supplies and have them delivered to the cabin. Disney Channel and Disney movies are available on stateroom TVs. Bathroom amenities feature Disney characters. 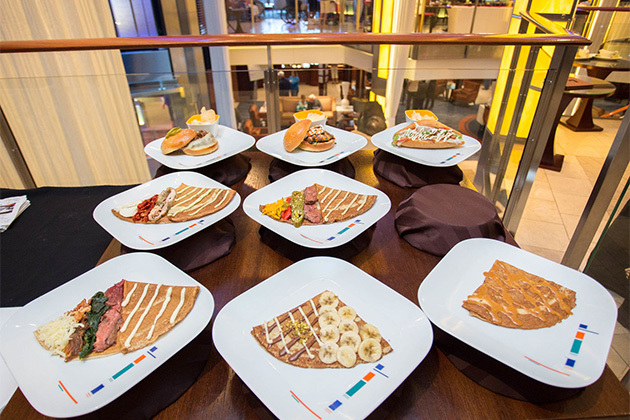 Celebrity's 11 ships serve a more upscale crowd and are known for having more sophisticated cuisine, amenities and activities than its sister line, Royal Caribbean. Yet its terrific kids programs still make it a hit with families. Celebrity's staterooms are considered some of the most spacious at sea. 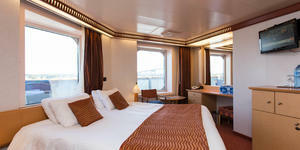 The line's well-designed family staterooms provide plenty of privacy and space. Family Veranda Stateroom: These spacious 575-square-foot suites are available on all Solstice-class ships. These are the only staterooms that fit five. They have two bedrooms, a large veranda, one bathroom and a living area with a pullout double sofa. The master bedroom has a queen bed and the second bedroom has a single bed. This is a particularly nice setup for a family with kids of different ages. The smaller child can sleep in the second bedroom, while older kids stay up and watch TV. Family Verandas can connect to Double Ocean View Cabins. These cabins have one bathroom with a shower. The Family Veranda Staterooms on the Millennium ships (Celebrity Constellation, Celebrity Millennium, Celebrity Summit, Celebrity Infinity) are smaller, only 271 square feet, but they feature a whopping 210-square-foot veranda for your own front porch at sea (opposed to the standard 38-square-foot veranda). These staterooms include two lower beds that convert to a queen, floor-to-ceiling sliding-glass doors, a sitting area with two sofa beds that convert to full-size beds and a privacy partition between the two sleeping areas. Aboard Millennium, Family Veranda Staterooms fit five, have one bathroom with a shower, but unlike the Solstice class ships, they do not connect with any other cabins. Most Celebrity ships have, on average, 60 to 80 connecting rooms with a variety of configurations. All room categories on Celebrity ships, from Inside to Ocean View, Veranda and Suite class, can hold four passengers, except for the Aqua Class. Typically, a room for four would have a king and a double pullout sofa. These rooms have one bathroom with a shower. Suite category rooms and higher would also have a full-size bathtub. In-room baby-sitting for up to three children is available for an additional fee. Kids menus are available via complimentary room service. Holland America known for its older clientele is checking in to the multigenerational travel trend. Its newest ship, Koningsdam (debuting in 2016), will be its first to offer cabins that sleep five. Holland America's current fleet does not offer any designated family cabins; Koningsdam will offer the first. Family Ocean View Stateroom: Koningsdam's 32 quint staterooms range from 222 to 231 square feet and feature two bathrooms, one with a bathtub and shower. Two lower beds convert to a queen, and there's a double pullout sofa and one upper Pullman-style bunk bed. 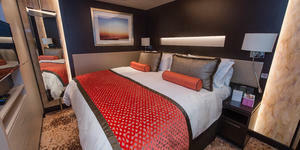 On average, 4 to 5 percent of Holland America cabins connect to other rooms. The newest ship, Koningsdam, will offer 150 connecting cabins. In addition, many rooms sleep three or four, and often you can find discounted cruise fares for additional passengers sharing a cabin. Complimentary room service can be delivered 24 hours/day and includes kid-friendly foods like hot dogs, hamburgers and chicken fingers. In-room baby-sitting is offered for $8/hour for the first child and $5/hour for each additional child. Complimentary video games and game players (Xbox or Wii) can be checked out for use in room.